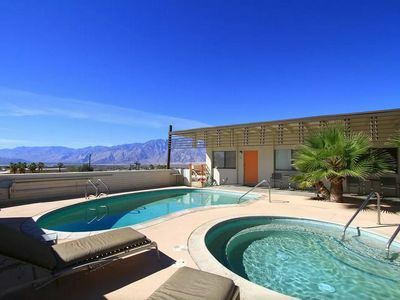 Located on a quiet street in Palm Springs's historic Racquet Club Estates, this three-bedroom, two-bath, mid-century modern home has been completely restored to include all the amenities you expect in a luxury vacation property. 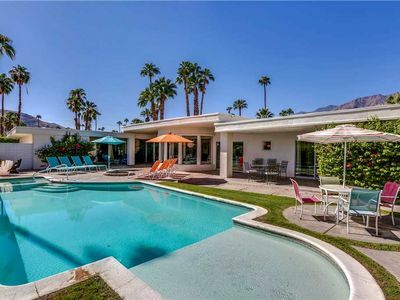 Designed in 1959 by famed Southern California architect William Krisel and built by the Alexander Construction Company, this home's soaring ""butterfly"" roof is an icon of mid-century architecture. 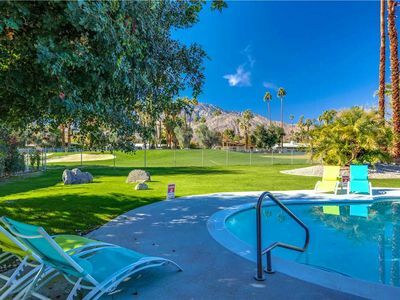 The huge outdoor area is a private paradise with stunning, unobstructed mountain views. You can swim laps or simply float all day sipping cocktails in the new saline Pebble Tec pool and spa. 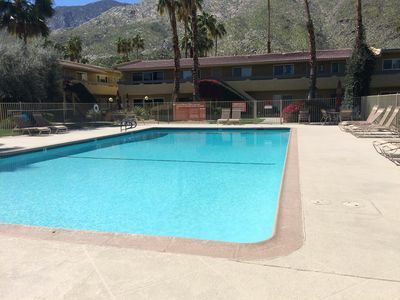 The large pool deck has a wonderful lounging area facing the mountains, an outdoor dining table shaded by a pergola, and a gas grill for cooking out. 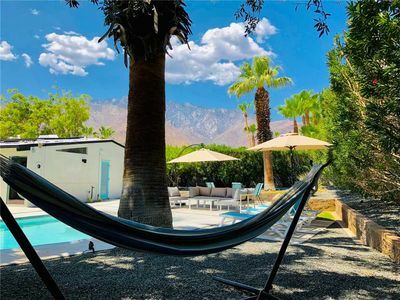 At night, gather around the fire pit for s'mores and watch the Palm Springs Aerial Tramway ascend 8,500 feet to the peak of the San Jacinto Mountains! 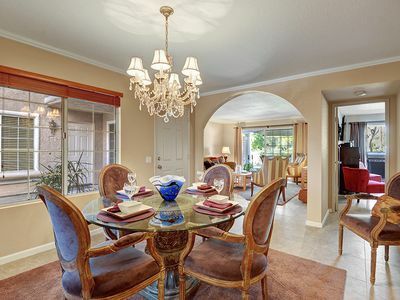 Inside, you'll notice how spacious the living/dining/kitchen area feels. 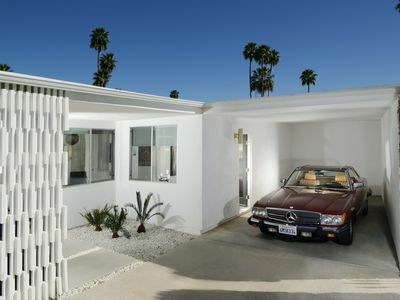 That's because the original owner had the home custom built four feet wider than the model Alexander home. The custom build also made room for an extra corner window in the living room that adds to the open and bright feel. 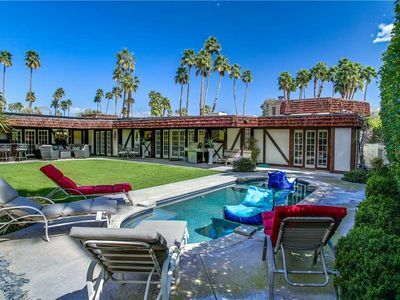 The floating fireplace,(decorative only) and wall of glass help create the indoor/outdoor living Palm Springs is famous for. The home is furnished with pieces by modern designers Florence Knoll, Charles Eames, George Nelson, Eero Saarinen, Harry Bertoia, Eileen Gray, and Achille Castiglioni. The kitchen cabinets, including the rare double-decker island, are the restored originals, complete with hairpin legs and pegboard doors. 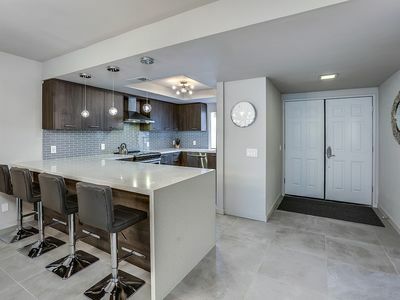 The kitchen has new stainless steel appliances, generous quartz counter space for meal preparation, and is fully stocked. All of the bedrooms are furnished with memory foam mattresses and luxurious cotton beddings for restful sleep and flat-screen TVs. The master bedroom sliders lead to a private lounging area; the en suite bathroom features the original sunken tub and an outside door for direct access from the pool. 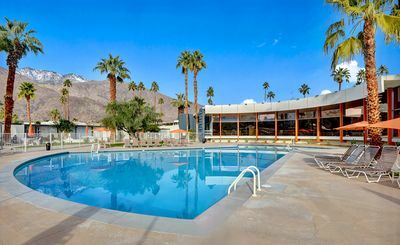 This luxury retreat is conveniently located just minutes from the nightlife, shopping, and top-rated restaurants of downtown Palm Springs, and near some of the world's most famous golf courses. 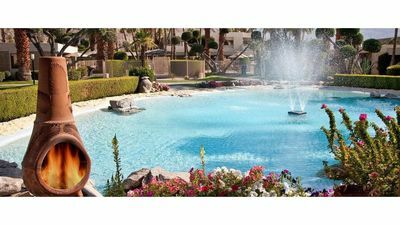 The enormous Cabazon Outlet Mall is only a 20-minute drive, and Los Angeles, San Diego, and Disneyland are a two-hour drive. 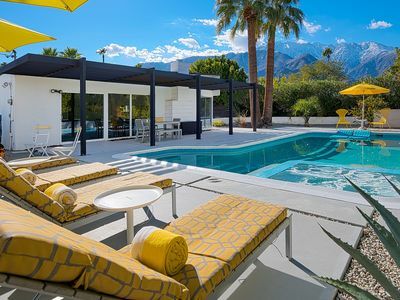 Come see why Palm Springs has been a playground for Hollywood stars for nearly a century, and is more popular today than ever. Enjoy your stay! 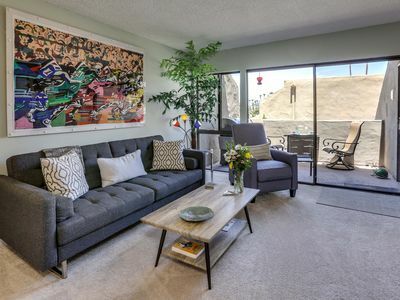 Cozy Condo in Old Las Palmas, Steps to Downtown Dining, Shops & More! 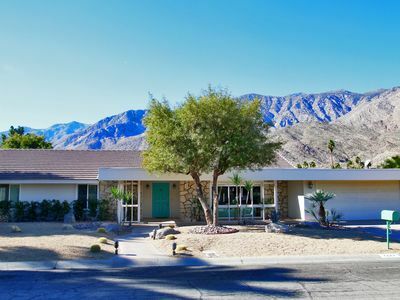 Beautiful English Cottage located in the heart of Palm Springs. Available NOW for April Music Festivals! 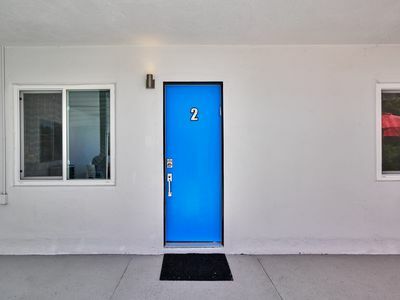 Fabulous home in a fantastic location !!! 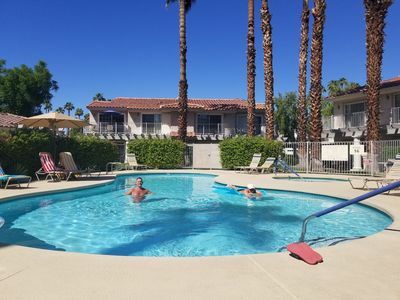 New Listing Smoketree Racquet Club Condo! King Bed! Pool! Spa! Tennis!Mt Views!